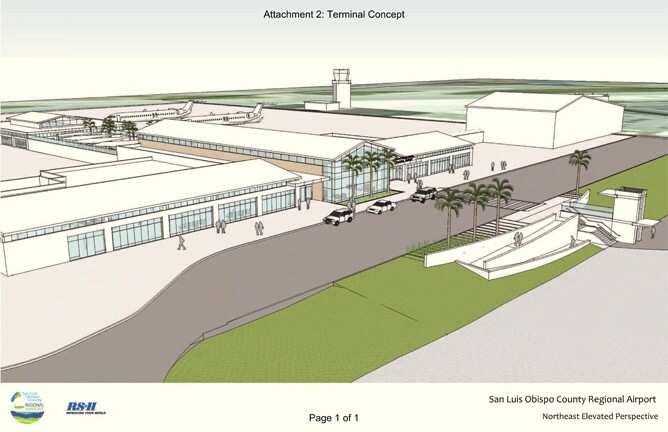 The San Luis Obispo County Board of Supervisors unanimously approved designs and gave the go-ahead to its Airport Services to move to the second of three phases in constructing a new terminal building at the SLO County Regional Airport. TERMINAL CAPACITY : The County Board of Supervisors approved Airport Services to move ahead with the second phase of terminal design and development for the SLO County Regional Airport. The airport currently sits on 340 acres of land south of the city of San Luis Obispo. The new, 46,500-square-foot terminal is being planned on the eastern side of the property, closer to Highway 227. The project has been in the works since August 2010, when the county accepted a roughly $1.1 million grant from the Federal Aviation Administration’s Airport Improvement Program for design of a new terminal. In March 2012, the board of supervisors approved a three-phased terminal design project, funding for which came from the FAA grant and just more than $57,000 in local passenger facility charges. Though the project remains in the concept phase, a preliminary cost estimate for overall construction comes to $22 million; the county expects the FAA to pick up $15 million of that tab and passenger facility charges to cover $3.6 million, leaving roughly $3.4 million of potential funding needed elsewhere. The second phase will consist of schematic, architectural, and engineering designs, as well as site and floor plan alternative configurations. Mike Mancheck, president of the Economic Vitality Corporation of SLO County, spoke before the board, reporting that demand from the business community for more flights and destinations is greater now than ever in the past. The expansion isn’t only needed to address passenger and flight capacity, Airport General Manager Richard Howell said, but also safety. He said the terminal currently isn’t up to safety standards, and the FAA wants to see the project move forward. Given the current schedule, construction of the terminal could begin as soon as spring 2015.